I can’t really take credit for this one. This would be the brain child of one Betty Crocker. No joke. I googled what I could do with the remains of my Gluten Free Bisquick and I found a recipe that has the words “Impossibly Easy” in the title. It was a done deal. Not only were they claiming that it would be easy, but impossibly so. This could make a lovely Thanksgiving breakfast. I figured all of you lovely people could use something IMPOSSIBLY easy right about now. Heck, I could use something easy, and I am only making cranberry sauce. Between getting your turkey in a brine, or lacing up your turkducken and the stuffing prep and the three different types of pie you got going on you deserve something that pretty much makes itself. Do you have flour on your face right now? That is how I imagine everyone today. Perhaps because that is pretty much what I look like in the kitchen…Nay, in life. I am the girl that takes a shower and then manages to get salsa in her hair two minutes later. What am I doing eating salsa two minutes after showering? Great question. I wish I had an answer for you other than…snacks. The recipe was originally for a French Apple Pie. When I put it in the oven I expected it to come out pie-like. I found that title to be grossly misleading. It’s a coffee cake. Plain and simple. It has a crumbly sugar-crusted top and would pair nicely with a festive warm beverage. Grease a 9-inch pie dish. In a small mixing bowl, combine your apples with your cinnamon and nutmeg. Toss them until the apples are coated with the spices. 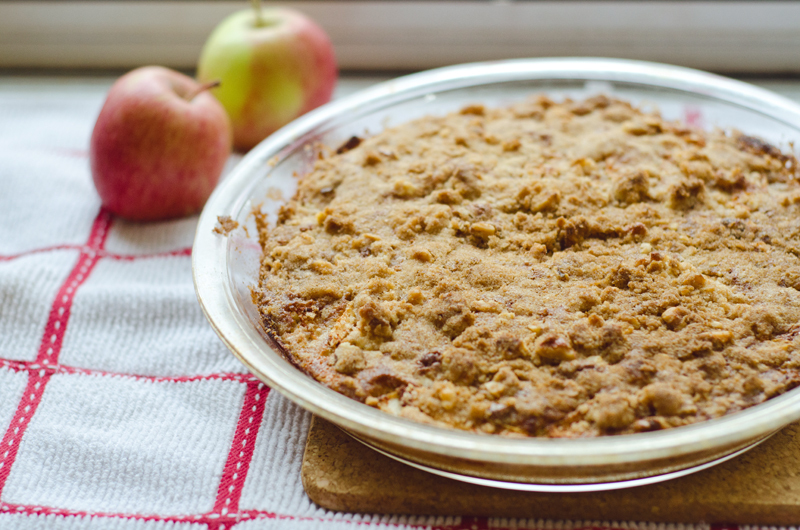 Place the apples in the bottom of your well greased baking dish. In a medium mixing bowl, combine the rest of your cake ingredients: Gluten Free Bisquick, sugar, milk, butter and eggs. Whisk it together until it’s well-combined and there are few to no lumps. Pour the cake mixture over your apples. In another dish combine all of your topping ingredients together. Using your fingers, mix them until they become a crumble. Evenly distribute the crumble mixture over the top of the cake batter. Put in oven and bake for 45-50 minutes. Your cake is done when a knife is inserted in the center and comes out clean. 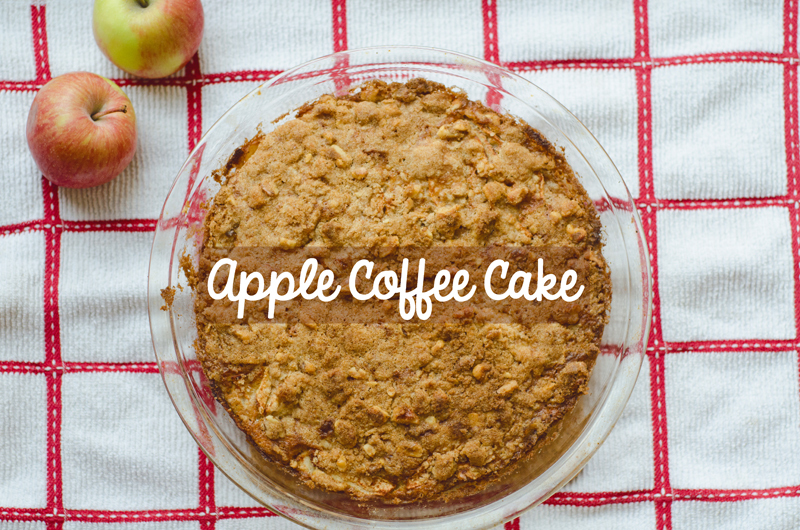 Finally an apple cake with lots of apples. I just need to ‘make my own’ Bisquick. I’ve got some GF flour mix in the cupboard.Thanks! This came out good, though I was wondering as I was making it. First of all, the butter — is it supposed to be cold butter and cut in? Soft butter? Melted butter? Kind of important. I made it, didn’t have GF Bisquick but had GF KA baking mix. I added at least another 1/2 cup of the mix because 1/2 c. didn’t seem like enough with 3 eggs… when it came out, it smelled very eggy so I was like “oh no, apple frittata…” but it was pretty good, my husband really liked it. The topping wasn’t crumbly at all because I melted the butter and it just sort of clumped on top. But it was tasty.